Apple management is so pumped up over the advantages presented by its forthcoming Mac OS X Lion operating system that the company has been holding back the release of at least one new Mac refresh until the software is finalized, AppleInsider has learned. For instance, new Thunderbolt-enabled Sandy Bridge MacBook Air models expected to go into production this month have been ready and waiting for some time, according to people familiar with the matter. But management is currently unwilling to usher the new models into the market with the current Mac OS X 10.6 Snow Leopard operating system. Instead, the Mac maker is said to be locked on waiting till it can image the new notebooks with a Gold Master build of Lion so that buyers are afforded the latest and greatest Apple experience. This includes complimentary iCloud services that will come built into the software, offering a means of automatic data synchronization that is both unparalleled in the computing industry, and paramount in an age when consumers are adopting a digital lifestyle in which they own and operate multiple mobile devices. The same methodology is believed to be in place for Thunderbolt-equipped versions of the Mac mini and LED Cinema Display, and will carry over Apple's forthcoming iOS devices like the next iPhone and iPod touch, which the company is similarly unwilling to ship without the iCloud-enabled iOS 5.0 software due this fall. Any decision to relent on this approach would need to be prompted by unexpected delays in the release of either operating system that would prove disruptive to the company's fundamentals by preventing it to push out new hardware in-line with its internal models, according to other people familiar with Apple's thinking. This strategy follows a company objective first revealed by AppleInsider prior to Apple's disclosures regarding Lion and iCloud at this month's Worldwide Developer Conference, in which it reported that management was determined to price Lion extremely aggressively and give away iCloud features for free in an effort to get the software into the hands of as many consumers as quickly as possible. During his keynote at the conference one week ago, Apple chief executive Steve Jobs confirmed that Apple would price Lion at $29.99, rather than the company's historical $129.99 fetching price for new versions of the Mac OS X operating system, and that users would receive the majority of its iCloud features at no cost, the exception being some enhanced storage and music functionalities that will cost a nominal fee. All said, while the Cupertino-based company's strategy continues to evolve with the times, it remains rooted in the same principle that Apple is a software-driven company that makes its money on the sale of proprietary hardware designed to best leverage its software expertise. Apple's investment in unique, cutting-edge notebook designs has paid off for the company, and in particular with the redesigned MacBook Air released last fall. In February, a person familiar with Apple's supply chain told AppleInsider that the thin and light notebooks were selling in volumes roughly half that of MacBook Pros —a major change from the relatively niche status the MacBook Air previously held in the company's product lineup. Even before the new MacBook Air, Apple had outgrown the PC market every quarter over the past five years. But the ultraportable Air was singled out last week by Apple Senior Vice President of Worldwide Product Marketing Phil Schiller during Apple's Worldwide Developers Conference keynote. "It's beautiful, it's thin, it's light, it's fast," Schiller said during the keynote. "The whole PC industry wants to copy it." 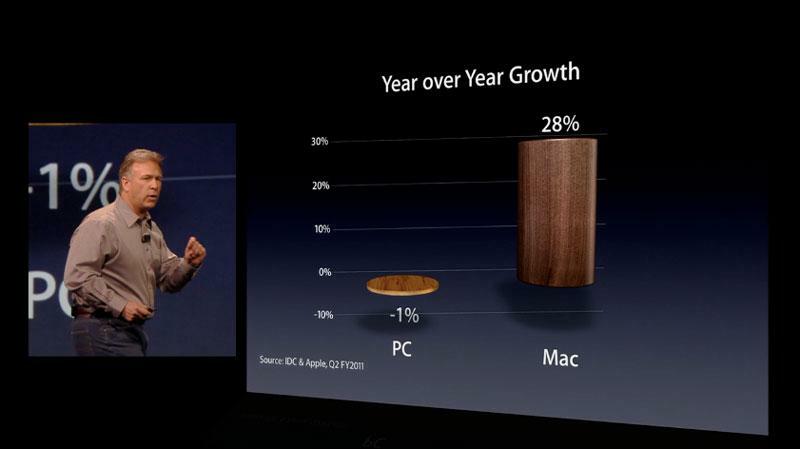 It's the PC industry that has been caught in a standstill while Apple has seen industry-leading growth. With an install base now at 54-plus-million active users around the world, the Mac saw 28 percent year over year growth last quarter, while the entirety of the PC market shrank 1 percent. AppleInsider was told earlier this month that Apple is prepared to build nearly 400,000 of its next-generation MacBook Air this month. But with Mac OS X Lion set to go on sale on the Mac App Store in July, Apple's initial production run could lie in wait until the software is made publicly available. "Whether you want a great new notebook or a killer desktop with the new iMac, these Macs are the best that we've ever made in the history of Apple," Schiller said. "And they're great not just because of the hardware they run, but because of the software." Expanding further on its software and services, Apple is also looking to increase the value proposition of its product line and surrounding ecosystem with the new iCloud service, which will be free when it launches in its entirety this fall. Some features of iCloud, including the ability to redownload content, is already available using iTunes 10.3, or the App Store for iOS devices. In addition to seamlessly syncing data, contacts and calendars across multiple devices —including Macs and PCs —Apple's iCloud also promises to simplify users' lives, making it easy to access photos, videos and personal files without the need to manually transfer or back up. Apple has boasted that its offering will be more full-featured than its rivals, namely Google and Amazon, as well as third-party services like Dropbox. And no PC maker that competes with the Mac lineup offers an integrated solution such as Apple's.